On Wednesday afternoon in the British Parliament, near the end of question time for British Prime Minister David Cameron, a short though incredibly revealing exchange occurred between Cameron and Respect Party MP George Galloway. Whatever one's preexisting views might be of either of these two polarizing figures is entirely irrelevant to the points and facts raised here about this incident. There certainly are reasonable answers to Galloway's point, but whatever one's views might be on those points, there's no denying it's a reasonable question. It is simply the case that the British government, along with its NATO allies including the US, were -- in both the wars in Syria and Libya -- on the same side as, and even arming and funding, the very extremists, "jihaidists," and even al-Qaida-supporting fighters they claim pose the greatest menace to world peace. As usual, anyone who questions the militarism of western governments is instantly smeared as a sympathizer or even supporter of tyrants. Thus, those who opposed the aggressive attack on Iraq were pro-Saddam; those who now oppose bombing Iran love the mullahs; those who oppose NATO intervention in Syria or Libya harbor affection for Assad and Ghadaffi -- just as those who opposed the Vietnam War 50 years ago or Reagan's brutal covert wars in Latin America 30 years ago were Communist sympathizers, etc., etc. Cameron's outburst was just the standard smear tactic used for decades by western leaders to try to discredit anyone who opposes their wars. 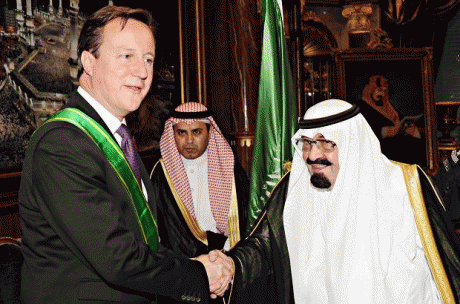 In January of last year, Cameron visited the region's most repressive dictators, the close British allies in Saudi Arabia. In Riyadh, he met King Abdullah and Crown Prince Nayef in order, he said, to "broaden and deepen" the UK-Saudi relationship. That "relationship" was already quite broad and deep, as "Saudi Arabia is the UK's largest trading partner in the Middle East with annual trade worth 15bn a year." Moreover, "a Saudi official told the BBC the leaders would discuss sales of the latest technology and weaponry, and making Britain a major part of a massive Saudi military expansion." Indeed, as the Guardian noted in 2012, "during the third quarter of last year Britain exported arms valued at more than 1m to Saudi Arabia, including components for military combat vehicles and turrets." In June, Cameron again visited Saudi Arabia as well as the UAE, and the Huffington Post UK reported at the time: "Cameron has been open about his desire to sell arms to the Saudis, the UAE and Oman." In November -- just two months before yesterday's attack on Galloway -- Cameron again traveled around to several tyrannical Gulf states -- including his close ally Saudi Arabia as well as the United Arab Emirates -- in order to sell British fighter jets and other military hardware to those regimes. As Amnesty International UK's head of policy and government affairs Allan Hogarth said: "Saudi Arabia has been the recipient of record-breaking arms deals involving the UK." Indeed, as the Guardian noted during this trip: "In 2009 the Saudi air force used UK-supplied Tornado fighter-bombers in attacks in Yemen which killed hundreds -- possibly thousands -- of civilians." Then there was that charming incident in May, 2011, when -- at the height of the violent crackdown by the Bahraini regime on democratic protesters -- Cameron welcomed Bahrain's Crown Prince to 10 Downing Street and posed for photographers shaking hands with the tyrant. Former Labour foreign minister Denis MacShane protested that Cameron should not be "rolling out the red carpet for Bahrain's torturer-in-chief." 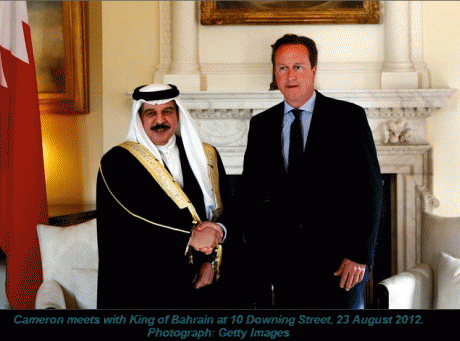 In August, Cameron met with Bahrain's King in London. While the Prime Minister's office claimed he pressed the King to implement greater political reforms, the Guardian noted that the King was "given red carpet treatment in Downing Street." "According to the figures the government approved the sale of military equipment valued at more than - 1m in the months following the violent crackdown on demonstrators a year ago. They included licences for gun silencers, weapons sights, rifles, artillery and components for military training aircraft. "Also cleared for export to Bahrain between July and September last year were naval guns and components for detecting and jamming improvised explosive devices." As Maryam Al-Khawaja of the Bahrain Center for Human Rights said: "The US, UK and France attack Russia for providing weapons to Syria, but that's exactly what they are doing for the Bahrain government; Russia is criticised for a naval base in Syria, but the US has one here." Of course, Bahrain wasn't the only close UK ally to violently attack democratic protesters in the kingdom. "During last year's uprising, Saudi Arabia sent forces to Bahrain in British military trucks." "CAMERON: He is a friend of Britain. Britain has good relations with Egypt." The following month, as Mubarak's crackdown intensified, "the British government refuse[d] to say whether it would follow the example of Germany and France and suspend exports of arms and riot control equipment to Egypt." In 2009, Britain sold 16.4m worth of arms to the regime in Egypt. "Britain exported over 100 million ($142 million) in weapons to Libyan dictator Moammar Gadhafi in the last two years alone. Included in those shipments are sniper rifles that may currently be in use against the Libyan opposition. Furthermore, Gadhafi's terror police are British-trained." So who exactly is it that is guilty of supporting every "brutal Arab dictator in the world"? At the top of any honest list, one would find David Cameron, along with the leaders of most leading NATO countries, beginning with the US (see here and here). Indeed, as Der Spiegel noted in April 2011 about yet another of Cameron's trips to visit Arab tyrants: "Cameron flew on to Kuwait, where he got down to the real purpose of his trip: selling weapons to Arab autocrats." Cameron's so-called "slapdown" of Galloway was predictably celebrated in many precincts. The reality, though, is that it was quite cowardly: he refused to answer Galloway's question, then smeared him, knowing that he could not reply, then simply moved on to the next questioner. Galloway was able to respond afterward only by posting an open letter on his website, noting the multiple Arab dictators steadfastly supported not by Galloway but by his accuser, David Cameron. The more important point here is that this so perfectly reflects the central propagandistic self-delusion amazingly sustained throughout the west. The very same western countries that snuggle up to and prop up the planet's worst dictators are the same ones who strut around depicting themselves as crusaders for democracy and freedom, all while smearing anyone who objects to their conduct as lovers of tyranny. That's how David Cameron can literally embrace and strengthen the autocrats of Saudi Arabia, Bahrain, the UAE, Yemen and so many others, while accusing others with a straight face of lending support "wherever there is a brutal Arab dictator in the world." In the most minimally rational universe, Cameron's act of extreme projection would provoke a sustained fit of mocking laughter. In the propaganda-suffused western world, it all seems perfectly cogent and even inspiring. The outgoing US Secretary of State on Wednesday unleashed this bizarre description of the Egyptian people: "It's hard going from decades under one-party or one-man rule, as somebody said, waking up from a political coma and understanding democracy." As As'ad AbuKhalil astutely replied: "The US and not the Egyptian people were in denial about the true nature of the Sadat-Mubarak regime. No, in fact they were not in denial: they knew full well what they were doing against the Egyptian people." In sum, any list of those lending support "wherever there is a brutal Arab dictator in the world" must begin with the leaders of the US and the UK in order to have any minimal credibility.